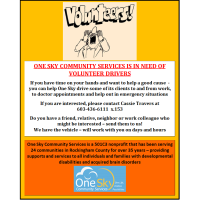 If you have time on your hands and want to help a good cause, you can help One Sky drive some of its clients to and from work, to doctors appointments and help out in emergency situations. Do you have a friend, relative, neighbor or work colleague who might be interested, send them to One Sky! They have the vehicle and will work with you on days and hours! One Sky Community Services is a 501C3 nonprofit that has been serving 24 communities in Rockingham County for over 35 years, providing supports and services to all individuals and families with developmental disabilities and acquired brain injuries.